Where is the telnet for Windows Vista/7 ? | Its Madh !!! 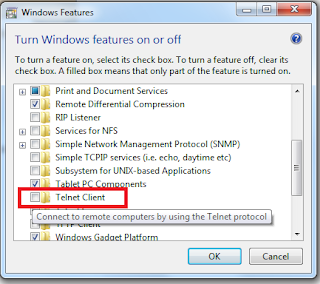 Home » Where is the telnet for Windows Vista/7 ? » Where is the telnet for Windows Vista/7 ? » Windows 7 » Where is the telnet for Windows Vista/7 ? 1. Go to Start -> Search for " Turn Windows Features On or Off "
2. Click on it, scroll down and check telnet clent, and click OK, Done !